Gold is a special resource that you can buy in the Bank or get as a reward for performing certain in-game actions. 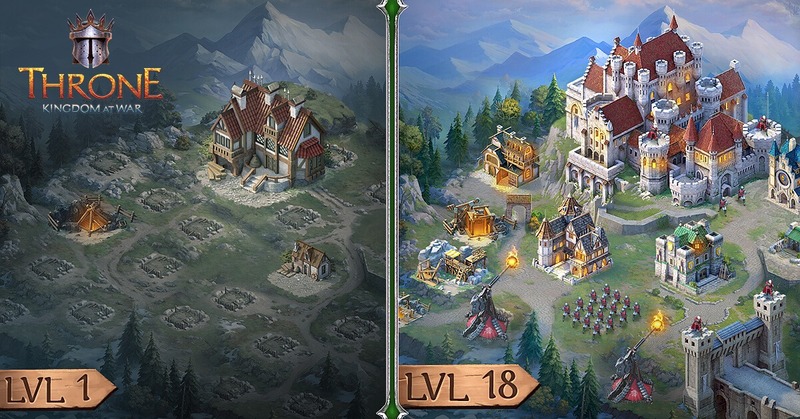 Use Gold to gain an advantage in the game – speed up or instantly perform the following actions: training warriors, constructing and upgrading buildings, conducting Studies, crafting Hero’s equipment and much more. You can also use Gold to make useful purchases in the Item Store. The amount of Gold you have in your Town is displayed in the top right corner of the screen, on the right-hand side of the resource panel. How do I use Hero’s Equipment? The Hero can use various types of equipment: weapons, armor, helmets, shields and talismans. Every piece of equipment put on the Hero gives certain bonuses to economic or military characteristics – that’s why it is very important to choose equipment with properties that best suit your current needs in the game. Remember that military bonuses affect only the troop led by the Hero. You can craft Hero’s equipment in the Workshop (Equipment tab). For this you’ll need various materials that you can get for performing certain in-game actions or by buying them in the Item Store. The better the type of the selected material, the more significant the bonuses the crafted equipment will give. You can also dismantle any piece of Hero’s equipment and get back one of the materials used in its crafting. To do this, go to the Inventory, select a piece of equipment and tap the “Dismantle” button. Assailants are unique opponents that appear on the Kingdom map. They have a significant health reserve, the amount of which is determined by their level. Level 1 Assailants are the weakest while level 6 Assailants are the strongest. Only your Hero can attack Assailants – send them to fight in order to get valuable materials for special equipment crafting and other useful trophies. Remember that in order to fight an Assailant, you need to be an Order member and to conduct the Unlock Assailants Study of the corresponding level. The mechanics of attacking Assailants are generally the same as for attacking other Lords or resource locations, except that you won’t need to send a troop of warriors. How do I change my userpic, name and Town name? You can do it in the Profile tab of the Palace. To change your userpic, tap the “Change userpic” button and select a new image in the window that appears. If this is not your first time choosing a userpic, you will need the Change Userpic item. If you don’t have this item, the “Apply” button will be replaced with the “Buy and Apply” button. To change your Lord’s name, tap the “Change name” button. If this is not your first time changing your name, you will need the Change Name item. If you don’t have this item, the “Apply” button will be replaced with the “Buy and Apply” button. To change the name of your Town, tap the “Change name” button. If this is not your first time choosing a name for your Town, you will need the Rename Town item. If you don’t have this item, the “Apply” button will be replaced with the “Buy and Apply” button. How do I restart the game from the beginning? You cannot restart everything from the beginning in Throne: Kingdom at War, just like in real life. There is no predefined end to the game, which is why even if you think you’re doing something wrong, you can always change your strategy and tactics. To make your first days of ruling as successful as possible, there is a special defense for novices in the game: other Lords won’t be able to attack your Town during the first three days. Moreover, you won’t lose yielded or produced resources even in the event of a successful enemy attack until your Palace reaches level 6. Please remember that registering several accounts in the game under one user violates Plarium’s multi-accounts policy and may result in restricted game access.